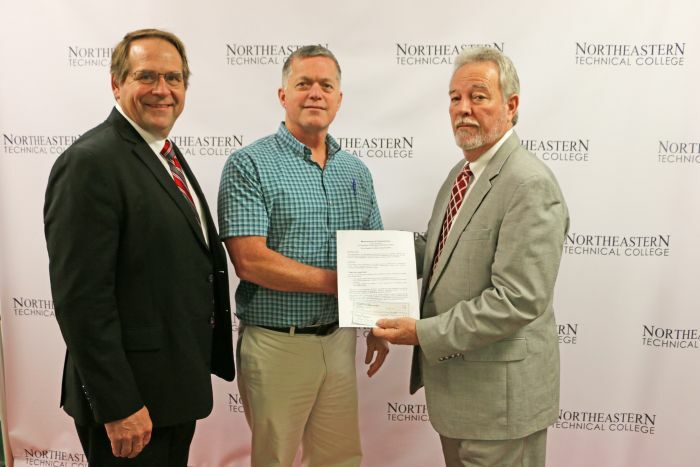 The Northeastern Technical College (NETC) Foundation recently received a generous $149,000 donation from the Chesterfield County Economic Development Alliance (CCEDA) to help foster economic development in Chesterfield County through NETC's workforce development initiatives. The donation is specifically designated to fund initiatives that support economic development in Chesterfield County, including those that directly benefit the four major population centers of Cheraw, Chesterfield, McBee, and Pageland. Projects can include the development, creation or improvement of workforce development programs, as well as initiatives that build the skills needed in the workforce by existing or new industries and businesses in the County. "The NETC Foundation is pleased to accept this generous donation which represents one of the largest single monetary donations ever given," said Foundation President, Dr. John Kirby. "We are honored to form this trusted partnership that allows us to help fulfill CCEDA's original mission to promote economic development within Chesterfield County. We will ensure that all funds will be used for the established purposes to improve the quality of life for all Chesterfield County residents through growth in economic opportunities in all areas of the county." The NETC Foundation is a 501 (c)(3) charitable organization, designed to support NETC's mission to make a difference in the lives of students and community. Donations made to the NETC Foundation are used to fund new programs to grow the college, and help remove financial barriers for students with scholarships and emergency relief. Photo: NETC representatives accept $149,000 donation from Chesterfield County Economic Development Alliance. Shown from left to right are NETC President, Dr. Kyle Wagner, CCEDA Chairman, Sam Hancock, and Foundation President, Dr. John Kirby.